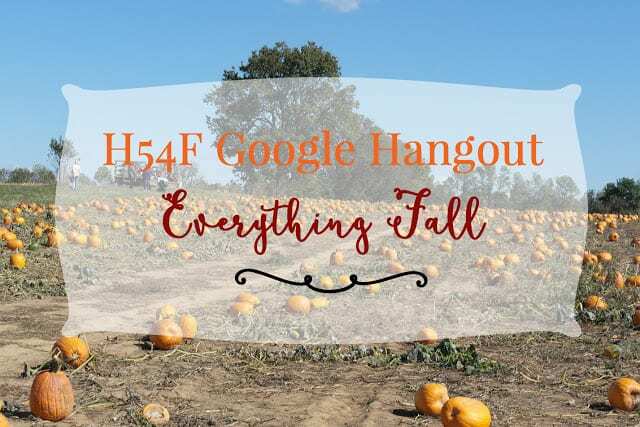 Don’t miss out on this month’s H54F Google Hangout–it goes lives at 9:30 PM EST tonight!!! Della, Caitlin, Katie, and myself as we chat about about everything fall. . .fashion, home decor, yummy foods, fall traditions, etc. Also joining us as a guest host will be Mariah from Faith and Fashion Blog. If you haven’t joined in on a Google Hangout, let me get you up to speed. A Google Hangout is a video/video chat platform where tonight’s hangout will be hosted. There are quite a few ways to watch! You can watch right here, on this post! The video will be available as soon as the hangout goes live, but you can watch it then or anytime thereafter. You can also watch on Google+ or YouTube! You don’t need a Google+ account to watch. BUT you will need one if you want to ask us questions live using the Q+A function. But if you don’t have one, no worries! You can still watch LIVE! You can also tweet us questions or comments using #H54FHangout. If you can’t make it, don’t worry about that either! We will be recording, and it will be available to watch later, whenever you want. We are so excited to have you join us at 9:30 PM eastern time tonight! The last 2 hangouts have been tons of fun, and I’m really looking forward to this one!!! !